The first time I wrote a preview for this, it ran to over 3000 words and I ran out of positive adjectives long before I’d finished covering the main card. It lost all impact, so I’m trying again. Let me put it simply. This is one of the most stacked MMA cards ever put together, never mind limiting it to free TV or the UFC. All it lacks is a title match (or two) and when it features five legitimate former world champions, a further two fighters who have competed for UFC gold, a clutch of TUF winners and finalists and is composed almost entirely of fighters known for their entertaining fighting style, that seems like a small thing to be missing. Five of these fights could easily produce the next no.1 contenders in their respective divisions, three fighters here can already account themselves as legends in the sport with half a dozen more either well on the way or certainly with the potential to do so. I don’t even have the will to break the matches down individually. It’s more than my tiny heart can bear. We have fighters who are notionally strikers and grapplers, but what EVERYONE on this card is, is a damn warrior. If anyone here embarks on a lay n pray game plan, it will be DEEPLY out of character. Let’s not forget that John Howard, Mike Pyle, Uriah Hall and Travis Browne are all well known for bringing it, even if casual fans might struggle to mark the names. Hell, even the PRELIMINARY card features the best Bantamweight in Europe, Brad Pickett against the last no.1 contender for that division’s title, Michael McDonald. There’s also the small matter of Connor McGregor’s sophomore UFC box against the impressive Max Holloway, with awesome matches featuring former WEC champ Mike Brown against Steven Siler and TUF winner Diego Brandao facing Daniel Pineda. It’s even starting a bit earlier than usual, which means there’s a fair chance that a UK fan like me might not pass out midway through the co-main event. You want stats, background all that usual stuff? Nope. Check on Sherdog if you must but for this card, I just want to sit back and let the sheer joy of being a fan wash over me. If you ever have a UFC party at your house, if you ever want to nudge a pal or family member to get into this sport – get them in front of the TV for this card. It is going to be biblical. I guarantee it. 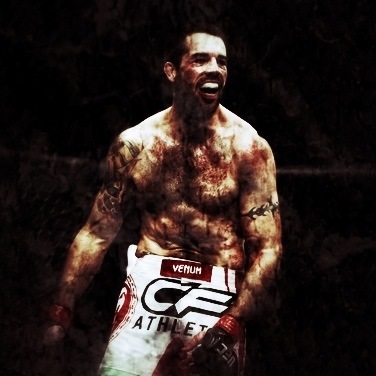 Ever since his appearance on the Ultimate Fighter season 7, Matt Brown has been a fan favourite with fans who appreciate a competitor who comes to fight, who leaves it in the cage, who goes out on his shield and insert further sound bytes. Another thing that endears Brown to us is his no nonsense attitude, his straight talking confidence, the fact that he doesn’t employ cunning smack talk, and just radiates a calm assurance in himself and willingness to go in and get the job done. Brown’s early UFC career was very successful with a 4-1 record marred only by a split decision loss to then unbeaten Dong Hyun Kim and more than made up for by his fun fights and stoppage victories. However, it all went a bit wrong in 2010 and 2011 as Brown suffered a 1-4 streak with only a decision win over the ever-game John Howard breaking up a series of humbling submission defeats. It’s been suggested that personal issues led to a lack of focus in training, but I don’t know what caused it. It’s not my place to comment. However, it is an acknowledged side effect of a willingness to go to war, to take a punch to give two, to eat your opponent’s best shot and smile at them that sometimes, it doesn’t work and that level of aggressiveness can lead to mistakes which will be capitalised upon at this level. Kept in a job by his tendency to be in fun fights and with a record hovering just above even at 12-11, Brown was at a crossroads. How did he respond? He rolled up his sleeves and got back to work. A TKO victory over the outmatched Chris Cope was followed by Brown spoiling the momentum of young wunderkind Stephen Thompson, handing him his first defeat. On a winning streak for the first time in three years, Brown stayed on his bike and racked up a other exciting TKO win over Luis Ramos. The upswing in his form earned him a shot on the main card of UFC on FOX 5 against one of the UFC’s most beloved sons, Mike ‘Quick’ Swick. With Swick having once been on the edge of a title shot, before injury left him on the bench for almost two years and fresh off an impressive win over Damarques Johnsonn, Brown was very much the underdog coming in to the fight. Shows how much the bookies know. Brown looked a step quicker and meaner than Swick from the start and kept the pressure up into the second round, earning a KO win for the biggest scalp of his career. That in itself led to another shot on a FOX broadcast, against British star Dan Hardy who shared a similar renaissance story having been very close to his pink slip. Unfortunately, Hardy was sidelined from the bout with a previously un diagnosed heart defect and was replaced by surging young gun, Jordan Mein. Brown was once again the underdog as Mein had a very fashionable reputation as the next big thing at Welterweight, and for a moment in the first round he looked all that as a brutal body shot folded Brown up like a cheap suit. Mein failed to capitalise and Brown rallied, coming close with a triangle choke and was the more aggressive fighter towards the end of the round. In the second round, it was all Brown as he battered Mein into submission, showing his experience by resisting the urge to knee the crumpling Canadian as he placed his hands on the mat. Big John McCarthy stepped in and all of a sudden, Matt Brown was on a 5-0 win streak, with four of them by stoppage and at least three of them very much against the predictions of the bookies. In the post fight press conference, Brown asserted that he’s very much interested in a title shot – after all, it’s why you lace up in the first place, isn’t it? A great many MMA journalists scoffed, with terms like journeyman and brawler being dismissively tossed around but it’s not only a future I’d like to see, it’s one that I think is more than possible. You see, I feel that Brown is not only a grossly underrated fighter – he has cardio to burn, very dangerous submission and striking games, as hard a chin as you’re going to find at 170lbs and despite his reputation as a brawler, he’s a canny ring general – but he has CHARACTER. Of course, anyone who fights at the top level has character, but few have endured such a roller coaster career as Brown, especially in such steadfast ‘I’m not changing’ fashion. Never once has Matt Brown played safe, never once has Matt Brown stopped to crying about referee calls, opponents being on drugs or that he had been concealing an injury. He comes to fight, and doesn’t make excuses when he loses. Some fighters enjoy the unrelenting praise of the mainstream MMA media, and others like Brown end up in the shade – as evidenced by the fact that he STILL hasn’t cracked the media-voted UFC top ten rankings. That doesn’t bother Matt overmuch, because he’s looked into himself and sees more than they do. Of course, he’s going to need a win over a top five fighter to get that call – Carlos Condit isn’t booked and I’d LOVE to see that fight. I’m not saying I think Matt WILL be the champion, I’m just saying that he could well do it. The measure of immortality is not necessarily in the manner of your victory, but in the way you face defeat with bravery, the way you stand up to a seemingly hopeless task. Against such odds are made legends which echo in eternity. This one felt really special coming in, with a stacked card and an inbuilt Strikeforce invasion storyline, we were all set for what could be one of the cards of the year. Former WEC fighter Anthony Njokuani can be relied upon for a striking masterclass but was pressed hard by another SF import, Roger Bowling. Bowling’s aggressive style probably earned him the first round, but Njokuani found his range in the second and Bowling pretty much ran straight into a short right hand than dropped him instantly. Stunning knockout, great performance from both men. Bowling drops to a 0-2 streak but I’m sure we’ll see him again, given the gameness of his performance. Incidentally, that’s Strikeforce imports at 1-1. The FX prelims continued the theme of knockout victories, but this portion of the show could be called the Team Alpha Male KO party as TJ Dillashaw, Joseph Benavidez and Chad Mendes all scored TKO wins that placed them (back) in title contention in their respective divisions. I guess that Duane Ludwig is a pretty good striking coach, then? 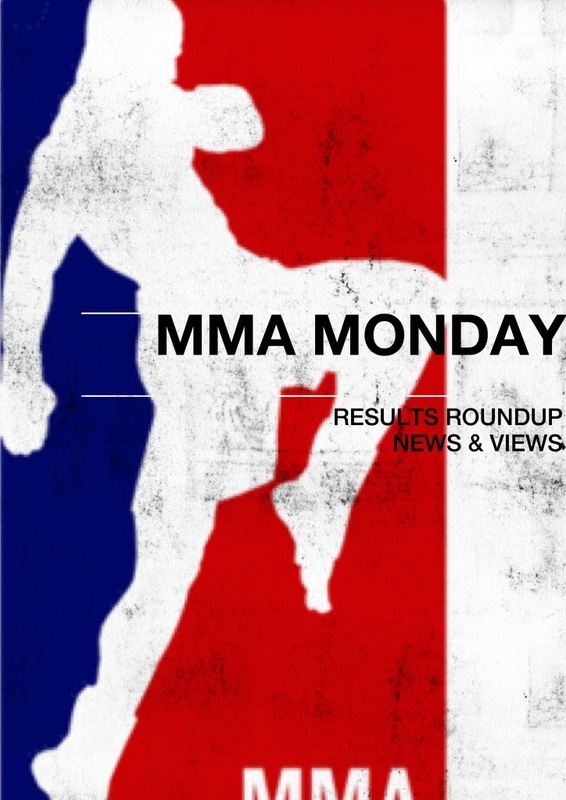 We also saw the train that is Myles Jury continue it’s impressive run, advancing to 12-0 at the expense of Ramsey Nijem’s chin and another pair of Strikeforce imports split close decisions as Jorge Masvidal gutted out a win over Tim Means and Lorenz Larkin dropped an even closer call to Francis Carmont. That’s 2-2 for the evening. Wow. We have a fight of the year contender on our hands here. Both guys started up at a real pace, both landing good shots but Mein got the first real highlight, dropping Brown with body shots and swarming , looking for the TKO. Brown responded by luring Mein into a super tight Triangle choke that the youngster somehow escaped from and the round ended with both guys trading blows and busted open. THAT is how you kick off a major broadcast. The second round saw Brown take charge, landing some heavy knees and backing Mein against the fence. As Jordan started to crumble, Brown kept up the pressure with elbows to the back which drew the TKO. Our next bout has a story all it’s own, as Josh Thomson‘s contentious trilogy with Gilbert Melendez could be seen as giving him something to prove against Cesar Gracie JJ, here represented by Nate Diaz who hasn’t ever been in a dull fight at Lightweight. Diaz started in classic fashion, pressing the action while Thomson adopted a stick and move game, trying to score leg kicks off the back foot while not getting dragged into Diaz’ preferred scrappy brawl. As Diaz began to get frustrated, Thomson started standing his ground more, landing a few high kicks and having Nate walk into some hard straight lunches. As Diaz tried to press him against the cage, Thomson landed a nice trip to end the round on top, 10-9 Thomson on my card. Diaz was more aggressive in the second, but it cost him momentum as he landed a (rather deliberate looking) groin shot that gave Thomson a minute to recover. Thomson busted Nate open with elbows before Diaz got a takedown and tried to impose his submission game, but to no effect. Back on the feet, Thomson returned to the high kicks which had landed nicely in the first frame and was rewarded with a sweet shin to forehead contact that staggered Nate and Josh followed up with some punches that turned the lights out. Following his contentious split decision loss to Melendez, this is a real vindication for Thomson and it makes him the first man to EVER stop Nate Diaz with strikes, an achievement that rightly won him a $50k bonus. The co-main event between Frank Mir and Daniel Cormier was plenty heated with the pair exchanging some real fighting talk in the run up. Mir looked in great shape, but Cormier’s confidence shine through. Sadly the match didn’t really live up to expectations as a slobber knocker, as despite Mir showing an expanded range of kicking in the early exchanges, Cormier largely stuck to a gameplay of backing him against the cage, controlling him with wrestling and wearing him out with body shots. Aside from a Cormier spinning kick at the start if the second and another Mir flurry at the start of the third, that was the story of the match. Grindingly effective, but not the explosive show that the San Jose crowd (or us) were really wanting. Despite his new training camp, Mir had no answer for Cormier’s quickness or wrestling and he really seemed to tire through the fight. On the other hand, Cormier lost a real opportunity to win the fight in more impressive fashion as he spent the bulk of the bout holding Mir in a position very reminiscent of where Shane Carwin uppercutted Frank into oblivion back in 2010. Now, if I could see that, don’t tell me that DC or Dave Camarillo couldn’t. Anyways, DC advances to 12-0 and has some decisions to make as he is de facto no.1 contender in the heavyweight division (depending on how Fabricio Werdum does against Big Nog) but that could well mean facing his teammate, Cain Velasquez. Oh, 4-3 Strikeforce, for those counting. Last but by no means least, we have our champion vs. champion main event. Would Benson Henderson or Gilbert Melendez make a real statement about who was the #1 lightweight in the world and would we be left with an undisputed champion? I’ll be honest, it was 3am here and play by play and round for round scoring was a little beyond me, but these two took each other to the wire and my instinct was that Melendez won the fight by being the more ‘front foot’ fighter. Nonetheless, Henderson retained the belt by split decision (48-47, 48-47, 47-48) to the great displeasure of the crowd, and incredulity of most folks on Twitter. I’m going to rewatch the bout at a reasonable hour and try and watch it with my judging hat on, because I couldn’t make a concerted point either way at this time. This throws open the usual controversy about judging, rematches and arguably some grand illuminati conspiracy to keep Benson as champion (it’s his third wafer thin decision victory in four title matches)… OK, scratch that last one as having more to do with me being REALLY tired. What really matters is that Benson moves forward as champion, once again. In any case, what scion of a shadowy New World Order could propose to his girlfriend, on national TV, after a successful title defence? Benson’s lady said yes, and we wish them all the happiness. Oh, and that contentious decision saved the UFC from losing on the night to the Strikeforce imports, tying the score at 4-4. I’ll just throw that one last log on the conspiracy fire…. In all seriousness, this was a GREAT card and the highlight reel knockouts from the prelims as well as the Brown-Mein, Thomson-Diaz and Henderson-Melendez fights are required viewing for MMA fans if you missed them. One last thought. But for the opinion of two judges, Josh Thomson could so very easily be the UFC Lightweight champion right now. How mad is that? Aside from the title match we dealt with yesterday, this weekend’s UFC on FOX card has a host of other compelling matches that deserve our attention. The fact that every main card match involves a Strikeforce alumnus and the show emanates from that promotion’s backyard in San Jose gives a curious theme to the broadcast that we’ll look at tomorrow, but for today I want to concentrate on the match ups themselves. First, lets look at the co-main event, which features former UFC champion Frank Mir (16-6) welcoming undefeated Olympian, Daniel Cormier (11-0) to the biggest stage of the sport. Mir has been at the top of this sport for a decade but comes into this bout off the back of a decisive TKO loss to then-champion Junior dos Santos last May which snapped a 3-0 streak and caused Mir to change up his training and join the illustrious Jackson-Winklejohn gym. Former captain of the US Olympic wrestling team, Daniel Cormier boasted an 8-0 record in Strikeforce and came to prominence when he stepped into Alistair Overeem’s injured shoes to knock out Antonio Silva and take a unanimous decision victory over Josh Barnett to become the Strikeforce Grand Prix champion. Stylistically, this is an interesting matchup as Mir has long been one of the top jujitsu guys in MMA (he’s subbed Rodrigo Nogueira, which says it all) but also has a well developed Muay Thai and classic boxing game, boasting KO wins over Nogueira (again), Mirko Filipovic in recent years. Cormier is of course an excellent wrestler, but has complemented that base with some fearsome power in his hands with seven of his eleven victories being earned with his fists (although two of those are listed as submissions). Basically, the question is who’s overall game is better? Mir has the edge in top level experience (in MMA at least) and is the larger man, but Cormier has disposed of experienced and larger fighters before and Mir cannot be looking forward to trading strikes with him or be at all sure he can win a grappling battle. Our next match will be a real contrast in terms of pace, as Nate Diaz (16-8) looks to recover from his failed title shot against newcomer Josh ‘the Punk’ Thomson (19-5) who had a storied history against Diaz’ teammate, Gilbert Melendez, competing for the Strikeforce belt three times, each taking a unanimous decision victory and Melendez winning their last meeting by a contentious split decision. Both of these guys are submission wizards with good striking and neither man has been finished in over six years. Expect a high pace, awesome displays of grappling and probably a little typically Diaz provocation. Definite contender for fight of the night. The first bout on the main card was to feature Dan Hardy, but his unexpected diagnoses with a ‘wolf heart’ has led to his whole MMA career being thrown into jeopardy. Stepping into the breach against TUF veteran Matt ‘the Immortal’ Brown (16-11) is highly touted youngster Jordan Mein (27-8). Thirty two year old Brown is never in a dull fight and has married his warrior spirit to a career best 4-0 streak, while Mein steps up to make his second UFC appearance and thirty sixth professional fight at the age of 23 riding a 3-0 streak. Brown is the veteran here, but faces a very different opponent to the one he started preparing for. An exciting and dangerous striker, ‘the Immortal’ has never been stopped with strikes and his real kryptonite seems to be a well developed submission game. However, with a very successful 2012 including underdog wins over Stephen Thomson and Mike Swick behind him, Brown stands on the edge of the top ten of the division for the first time in his career. Mein is very much the next big thing, who earned a real crack at a jump up the ladder with his first round TKO win over veteran Dan Miller last month and willingness to face an opponent like Brown on relatively short notice. Despite his tender years, Mein is far from inexperienced and boasts wins over the likes of Josh Burkman, Marius Zaromskis and Evangelista Santos en route to the UFC, so he is unlikely to be overawed by suddenly being on the main card against a name fighter. 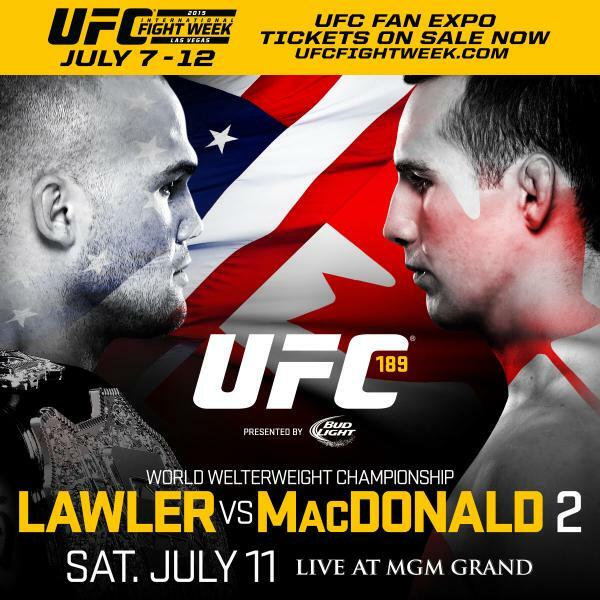 Both fighters first plan is to out strike their opponent, so this has all the ingredients for a fun fight and whoever wins, it heralds the arrival of a serious contender in the 170lb division. On the undercard another Strikeforce veteran, Lorenz Larkin (13-0, 1NC) makes his debut against Francis Carmont (20-7) in a compelling Middleweight battle, while Chad Mendes (13-1) faces off with Darren Elkins (16-2) and Joseph Benavidez (17-3) fights Darren Uyenoyama (8-3) in bouts with real significance for the top of the Featherweight and Flyweight rankings respectively. 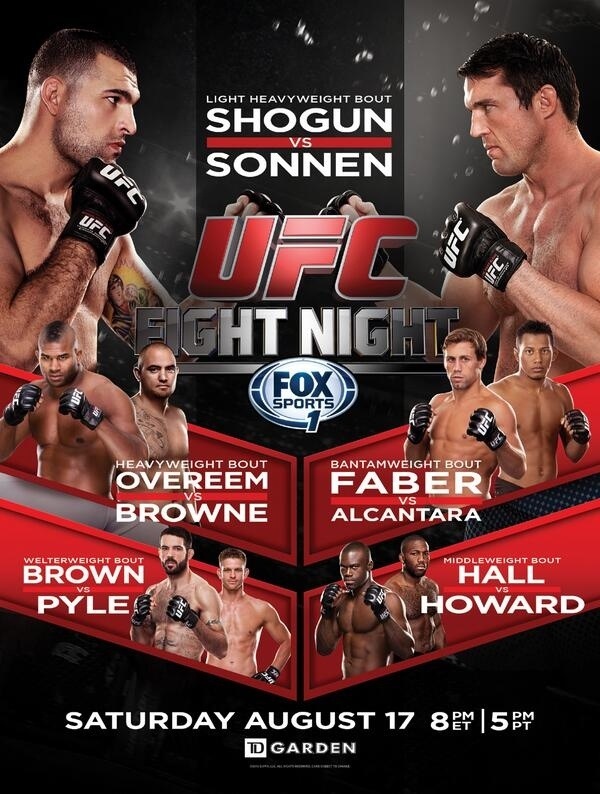 Its a stacked card, and the Facebook, FX (UFC.tv in the UK) and FOX (ESPN) all deserve your attention. The Strikeforce invasion of the UFC is on! We’ve had announcements that Gilbert Melendez will challenge for Benson Henderson’s Lightweight title at UFC on FOX 7 on April 20th. They’ll be joined on that card by Daniel Cormier making his Octagon debut against UFC veteran Frank Mir and Dan Hardy getting the match he asked for against Matt Brown. That’s turning into a hell of a card. We’ve also had confirmation that Alexander Gustafsson will welcome Gegard Mousasi to the UFC at an event in Stockholm on April 6th, likely to be UFC on FUEL TV 9. That’s another awesome match, although I just hope the UFC give Gegard some promotional backing so that casual fans appreciate his quality. Closer to home, Cage Warriors have announced the main event of CW52 in London as being a Welterweight title fight between Gael Grimaud and Cathal Pendred in what should be a fantastic bout. Arguably the biggest MMA card if the week didn’t come from the UFC as Bellator produced two compelling title matches and a pair of upsets in their debut show on Spike. As predicted, Pat Curran and Patricio Friere out on an excellent advert for MMA in a bout that lacked nothing but a finish. The split decision win for Curran was probably about right but you’ve got to feel for Friere who has twice fallen short in title matches by the slimmest of margins. Curran will go on to face last season’s tournament winner, Daniel Straus. I expected Michael Chandler to get the win over Rick Hawn, but I didn’t expect him to submit the judoka. Hawn is no joke and Chandler is easily the best lightweight outside the UFC at this point in time, to the point that its hard to see anyone on Bellator’s roster toppling him. In the LHW tournament, name fighters Renato ‘Babalu’ Sobral and Seth Petruzelli were eliminated by the relatively unheralded Mikhael Zayats and Jacob Noe respectively. Zayats in particular impressed and is just another one of the coming crowd of Russian sambo practitioners making a real impact in US MMA. Just to remind everyone that there is a vibrant MMA scene in the US that isn’t on network television, RFA offered up a compelling card which had notable wins for UFC veteran Brock Larsen and fighters who’ve had a handshake with the big time James Krause and Dakota Cochrane. RFA are one of many nascent MMA organisations in the states and its always worth keeping an eye on the alphabet soup to see if anyone is making a real name for themselves. The UFC’s first card of the year served up the usual mix of shocks and confirmations of what we already knew. Belfort then proceeded to call out Jon Jones, in what I’m going to assume was an act of bravado designed to get cheers from the Brazilian crowd, who would happily cheer Vitor against Jones, or Chael Sonnen but not so much against the almost deified Anderson Silva. Elsewhere, Gabriel Gonzaga continued his career resurgence with a submission win over Ben Rothwell and Khabib Nurmagomedov continued the Russian invasion with a first round stoppage of Thiago Tavares – having already antagonised the Brazilians by inferring that jiujitsu is inferior to Sambo. The most controversial moment of the night came when Yuri Alcantara took Pedro Nobre’s back and started reigning down blows. Nobre turned his head and referee Dan Miragliotta warned Alcantara about hitting the back of the head, only to stop the bout a second later with only one more blow thrown – a blow that really didn’t hit the back of the head. Nobre lay there, clutching the absolute centre of the back of his head and saying he couldn’t continue, compelling the referee to call the match off as a no contest due to an accidental foul. Now, I’m off the mind that Alcantara’s blows were legal, that Nobre tried to move his head so he got hit in the back and he could escape without a loss on his record and reinforced that by groaning and holding his head in a place where he hadn’t been hit. What is this, football? Basically, Nobre stole a win from Alcantara via gamesmanship which is expressly outlawed in the unified rules. Not cool. It never stops! 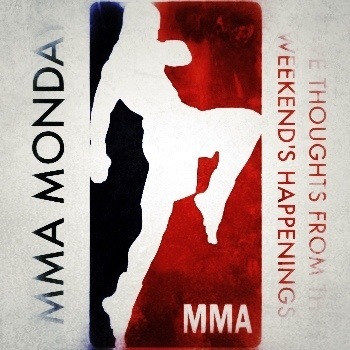 This week, we have UFC on FOX 6 and Bellator 86 previews for you as well as some articles on whether its acceptable to boo at MMA events and if I can get it started, our beginners guide to MMA. Hope you’ll check it out.